« Who Are The Ad Wizards Who Came Up With This One?! Today’s feature may be called “Back to the future” or “Forward to the past” because it goes back to the time when this metro area had a commuter rail which some of us so desperately want now. Black and white film negative of two trolley cars on the Strang Line between Pflumm & Haskins on Walnut. The car at the left is an open car. Text on the left end: “SANTA FE TRAIL ROUTE.” Text along the side of the car roof: “MISSOURI & KANSAS INTERURBAN RAILWAY.” The car has a number of seated passengers and two children stand in the end of the car. Several of the women passengers wear hats. The right car is an enclosed car. An oval on the side of the car, in which the name of the car is may read “OGERITA.” The building at the far right is the Lenexa mill. 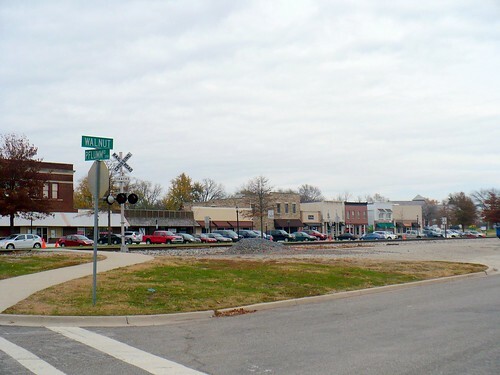 A portion of a railroad stations appears to be visible behind the cars. Several utility poles run along the track. A portion of a house is visible at the extreme left. Bare dirt in the railroad right-of-way is in the foreground. You can find a brief history of the Strang Line on the the JoCoHistory website. 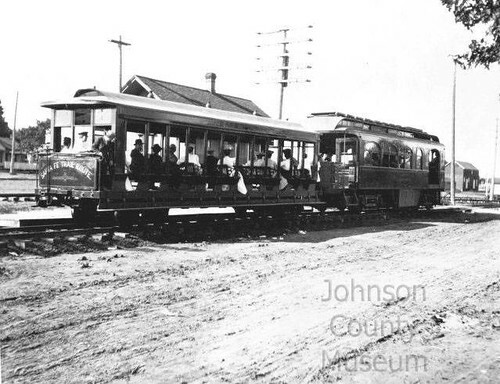 Strang Line (officially named Missouri and Kansas Interurban Railway) was developed by William B. Strang Jr and existed between 1906 and 1940 providing a link between Olathe and Kansas City and further on to St.Joseph. A book by Monroe Dodd (recently laid off from the Star so buy the book!) A Splendid Ride: The Streetcars of Kansas City, 1870-1957 has more details and a better quality picture of the same or similar train. A website by Ed Gentry is dedicated to the Interurban linking Kansas City and St. Joseph. Today the old Strang Line can still be traced on the map and in a surviving street name. The site of the old picture still has rails but they belong to the real railroad. Maybe some day we will be able to ride “the highest, coolest and most beautiful ride out of Kansas City” and create our own fond memories. This look at the past was brought to you by the Kansas City Lunch Spots : Where Lunches and Spots Meet In The Open. Also sponsored by: My Job: Three-day weekends – plenty of time to waste Additional financing by: Light Rail: Dream on.